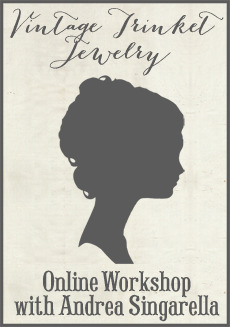 These days, there are so many wonderful shops owned by women in Blogland. After reading their blogs for some time, I almost feel like I know some of these girls. I'm sure you probably know what I mean. The amazing Internet connects us all in big ways. I always try to support my fellow women entrepreneurs, and wanted to share a few pretty packages that have found their way to my mailbox recently. The picture above is a new (old) hat I bought from Heather's shop, Pretty Petals Boutique. It's covered with strawberries and, well, you know I couldn't pass it up. Heather sure knows her stuff when it comes to pretties! One of my "to do" projects is to get my collection of old hats hung on the wall in the studio. It will require a ladder and moving an awful lot of stuff....but one of these days I'll do it! Do you remember a month or two ago when I wrote about the tough week I was having, being sleep deprived and still trying to adapt to my new role as mother of 2? Well, that week I received this surprise package in the mail from my friend Jeni. At that time, I didn't really know her and she didn't really know me, but she read my blog and wanted to send something to make me smile. As I stood in the kitchen and opened the box, tears rolled down my face. I was so incredibly touched by her kindness and thoughtfulness. Can you believe how wonderful this box of goodies is? 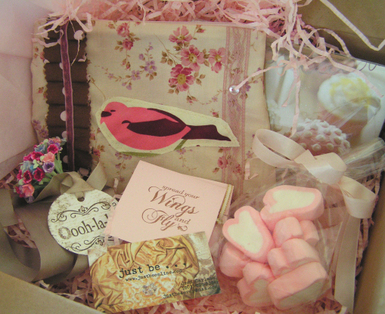 She filled it with pink things she knew I would enjoy such as millinery flowers, note cards, heart marshmallows (yum) and the cosmetics bag you see with the ruffled trim and pink bird on it. She is one of 2 women behind the company just be, a fabulous web boutique that sells one of a kind handmade purses and girly ruffled skirts. I love their stuff! The philosophy and tag line of the company is that there is beauty in individuality. It's so true. Thank you again, my friend. These fun and colorfully wrapped parcels came from the Ohio girls at McMaster & Storm. Shop owners Kara and Darcy have a brick and mortar store and are expanding into the world of e-commerce in March! (Great for them and bad for my checkbook.) I called their shop recently and got to chat with Kara. What a sweetheart. We talked shop as I placed an order of luxury soaps (for my mom's Easter basket), gourmet candies and this fabulous "fastener", among other indulgences. 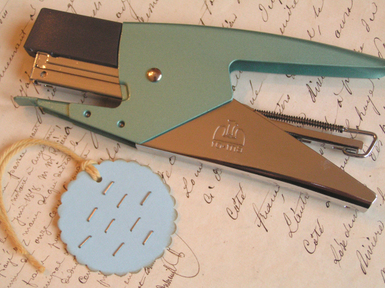 If staplers can be graceful, this one's the ticket! It gently fastens pages together with tiny little brushed metal staples, and it doesn't jam. I think I am in love with it. I just want to staple everything! I would like to take a trip down to their store sometime when I'm visiting family in Ohio.... even though it's on the other side of the state. Maybe someday I'll take a detour. These are just a few of the many warm-hearted women I have "met" through their blogs and shops. There are so many more that I think I'll do another post soon .....Shop Girls ~ Part II. Stay tuned. Glad you loved your hat Andrea! That is sooo sweet what Jeni sent you... love the little marshmallow hearts! I must get one of those stapler fastener things. I am always fighting with mine. Hi Andrea! I just received two packaged from you this week and everything is just beautiful! 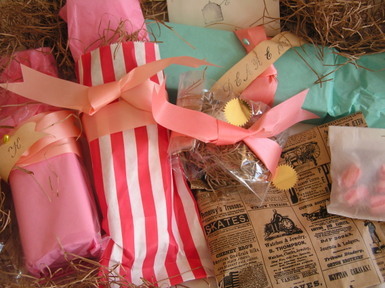 I love the way you package everything and the yummy lollypop too!! Thank you so much, I cant wait to get started on my goodies! I am the mother of five little boys from ages of 9-3. I know how hard it is to adapt, I sure hope things are getting easier for you! Love the hat from Heather. How sweet of Jeni to send you a gift. God bless Sam on his baptism.both my grandbabies are getting christened Sunday also and i am so looking forward to it! have fun visiting and sharing the love!!! How beautiful! Enjoy your new stapler! It's so cool! I think I need that stapler like that one. How nice the women are in blogland. You have a nice weekend too! I love the packaging! I may have to think again on some of the packaging for my own products! Hi! I'm a long time reader, first time commentor...everything you received is just lovely! McMaster and Storm is a FABULOUS place...I know you would love it! I'm lucky enough to live fairly close, so I've been there a couple of times...Darcy and Kara are amazing! I love everything in your shop, too! Did you get my e-mail? I tried to send you my info. I hope you got it. I will keep checking my e-mail from you. Please leave a message on my blog if there is a problem with the e-mail. Thanks! i know you're enjoying your time w/ your family. after this blustery cold day...what a treat to see results of our wrappings from a "blog" view this evening. Wonderful post...I love the new hat! Gorgeous. I am totally in agreement that there are some very inspiring and creative women out there in blogland! I have to tell you that before reading this post we received our One Hundred Wishes package and my 17 year old noticed the cute little staples holding our bundles of ribbon together. I may have to give the "Ohio Girls" a call! wow, i truly love your adorable shop! I also am a fan of Mcmaster and Storm. I can't wait to order some of your lovelies for my shop! I really like your blog! I am so glad I found you. 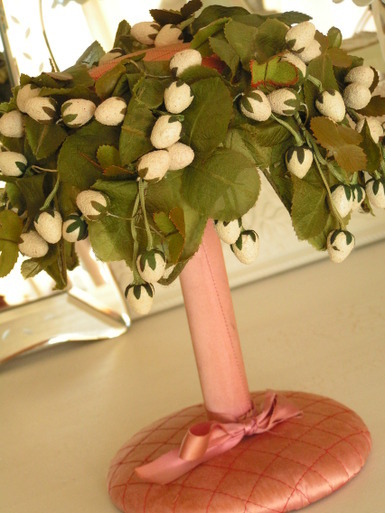 I was searching for millinery leaves and here you were with the sweetest embellished eggs! I am currently creating a velvet leaf wreath with vintage brooches on it and pretty ribbon, I hope I find all the supplies my mind is dreaming up! I know about life with two kids, I have two boys and I never sleep. :) Good luck with that and thanks for being inspiring!